If you work on your bike at all, then no matter how careful you might be, chances are you will eventually tarnish your pristine garage floor with a nice black blob of oil that will turn into a nearly impossible to remove stain. Pour-N-Restore Oil Stain Remover offers a new twist on old grease-removing options like pouring gasoline on a stubborn stain- it won't kill the earth. Well maybe that's a bit dramatic, but it is a biodegradable and environmentally safe product which is definitely not a bad thing. A lot of degreasers use solvents that will clear up a stain but end up drawing it back up when they dissolve. Pour-N-Restore is unique in the way it works. You just pour the liquid on the stain and leave it for eight hours. It works its magic and eventually turns into a powder that you just sweep up. The manufacturer says its trademarked Micro-Extraction Technology basically grabs onto oil molecules and then pulls out the entire stain and dries on the spot. Whatever the trick, it seems to work well on everything from cement to stone to paving bricks. 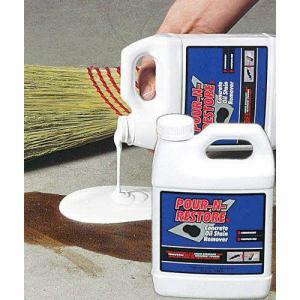 You're not supposed to use it on asphalt, but it works on all sorts of stains like motor oil, brake fluid, anti-freeze, and even cooking-oil for those times you happen to be frying up some chicken while you are removing your air filter. your garage smell like an orange exploded inside. But hey, that's better than a nasty ol' grease stain any day. This helpful kit will help you restore order to your garage as well.